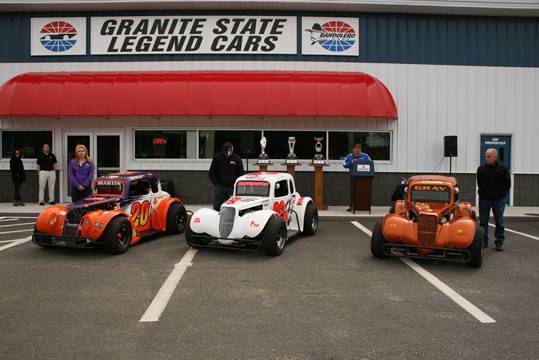 The stars of New Hampshire Motor Speedway’s Legends division racing series were on hand Friday to help the track kick off the 2014 season for the developmental division at the track. Shaun Buffington, last year’s oval and road course series Legends champion at New Hampshire Motor Speedway was on hand along with nine-time New Hampshire Motor Speedway winner Tom Gray and 16-year old female driver Taylor Martin. The 2014 Legends season officially kicks off Saturday in Loudon with the running of the first Moat Mountain Road Road course series and Sign Works oval series events of the season. Friday’s Legends media day in Loudon was held outside the Granite State Legends Cars dealership at New Hampshire Motor Speedway, which provides those interested in getting involved everything needed to get started. The Granite State Bandolero Series and North East Mini Stock Tour will also be in action Saturday at New Hampshire Motor Speedway. There’s no charge for grandstand admission. Infield passes are $15.